The need to polish and wax your car every few months is a thing of the past thanks to the finest quality paint protection. Instead of spending hours cutting and polishing your car, you only need to take a few minutes to wash it to make it look like new again. All thanks to paint protection. Paint protection bonds with the clear coat of your car to protect it from oxidization, pollution fallout and fading. It also creates a barrier to repel the effects of acid rain and bird droppings. The paint protection treatment provides a Teflon based coating infused with anti-detergent agents to prevent its protective layer being washed away. Protecting your vehicles paintwork with paint protection not only guarantees you a better re-sale value, it also helps you to maintain your vehicle with ease. 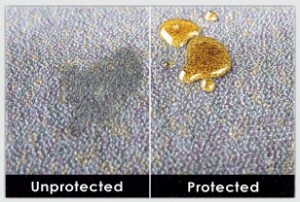 There are hundreds of ways to stain the seats and carpets in a vehicle and the best way to make sure you can get those stains out is to have a high quality professionally applied fabric protection installed. This Teflon based treatment which fuses with fabrics and carpets to create a barrier which is resistant to stains, soiling and wear. The product is Colorless, non-toxic, allergy free and is safe for all fabric types. Many prestige cars have leather interiors. The leather looks great and feels fantastic when new, but as the leather is exposed to heat, UV light and other contaminates it begins to dry out and eventually crack. Leather protection is a nourishing treatment that moisturizes and seals to avoid cracking. Surfaces treated are non-static, repel water and are odorless. The leather is soft and becomes easier to clean and maintain.